How should we evaluate the qualifications of a candidate for public office? If we stopped to think about it for a few minutes, that is something most of us could easily explain. So why do we elect such crooked politicians. We are hypocrites, apparently. We say one thing, and we do another. For example, we say we don’t like negative campaigning, but doesn’t negative campaigning earn some candidates lots of airtime. Isn’t trashing your opponent doubly profitable? At the same time a slick politician shreds the reputation of his opponent, he gets lots of free air time. And he is a good salesman and entertaining, he can make himself look good and that other guy look awful. And yet we are crazy to fall for such a stunt. 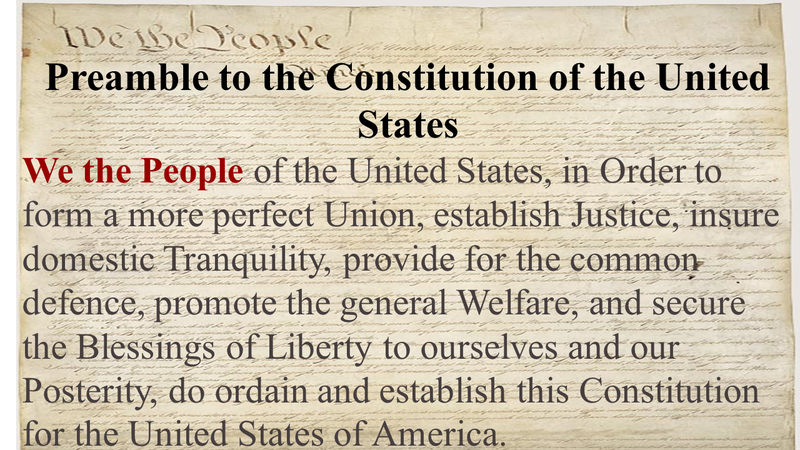 Read that Preamble above. The US Government is far more than just an enterprise that spends trillions and decides the fate of trillions of dollars every year. We each depend what our government does for us. The health and safety of our friend and relatives depend upon our government doing a good job. Do we care? Does it show? How do we choose the people who run the government? Don’t we listen to a bunch of fast talkers tear up each others character? Don’t we then we pick the person who does the best job of slinging mud? Look in the mirror. Ask yourself. When you go to the polls, what do you know? Did you visit the candidates websites? Did you read about what each candidate has actually accomplished? Do you know if the mudslingers are telling the truth or just hiding their own dismal records? On March 1st we will have a Presidential Primary in Virginia. If you want to know who will be on the ballot, check the Candidate List at the Virginia State Board of Elections. Not sure where to vote? Please visit the Virginia State Board of Elections, but do your homework. Before you vote, seriously consider the candidates. Which one will do what is right? Who is my top choice? Ted Cruz. Why? I think Cruz is the most honest and competent of the candidates. I also like what Cruz has at the top of his Issues List => RESTORE THE CONSTITUTION. If we don’t leave our children and grandchildren a constitutional republic, then what kind of government will we leave them? I think you bring up a good point Tom about the vast difference between societal claims against negative campaigns and the actual results of them, which favor obnoxious mudslingers whose last name rhymes with rump. Whoops, did I say that out loud? I just got though watching the Republican debate where Rubio and Cruz got a lot of good hits on Trump and his many inconsistencies and flaws were exposed. The was boorish and insulting in response but I bet his poll numbers rise tomorrow. I’m with you and Citizen Tom on Ted Cruz, and I have been cheering him on as a presidential candidate for years. I think the difference between claims and results is not hypocrisy, but something more basic: You care about politics. You’ve educated yourself on the issues, the principles, and the candidates’ adherence to issues and principles. But the vast majority of voters don’t bother, it seems to me. Most get involved only when election season is in the air, and only superficially at that. So, while knowledgeable observers like you and Citizen Tom are dismayed at the results, those results are largely from people who know very little about these folks, and are voting based upon distorted media presentations and vague notions of what the issues and principles ought to be. This is not a happy thought, but as a hypothesis, it does seem to explain the behavior, the polls, and the voting results we observe. Well said Keith, I think you make a lot of sense. I wonder if it’s always been this way, or was there ever a time when the majority of people actually understood the momentous act of voting and the importance of electing the right people? If you read the Federalist and Anti-Federalist arguments (I’ve recently gone through all of them, and will post about them soon) you get the impression that almost all citizens who could vote were active participants and knowledgeable. Certainly the level of knowledge of these writers was impressive. But one could get the same impressions reading your blog or Citizen Tom’s. Nevertheless, other evidence of education changes overt this long span of time makes me think that the ratio of thoughtful and well-considered voters was high originally and dropped over time. For one point, the framers would be scandalized to learn that a thorough treatment of American history was not part of a school’s curricula. These days, teachers are horrified that it IS taught, and it is now generally minimized, trivialized, or inverted to teach only negative aspects of our heritage. To the extent that survivors of this process even bother to vote, they do so from a platform of intentional historical ignorance. I get the feeling when I read the Federalist and Anti-Federalist Papers that those guys gave the subject of government much more thought than I ever have. Look forward to your posts. We have an education system run by the government. Even the Feds have their unconstitutional nose in it. When we don’t trust politicians, why do we want the government to teach our children? Even a moron should know socialism costs too much. Even a moron knows politicians cannot be trusted. Yet we use a socialist construct to educate our children. Why? There was a time when people understood voting is a privilege. If you were not an adult who paid taxes, you could not vote. Now we give that privilege to children and freeloaders, and we choose showboats and thieves to lead us. That result was almost wholly predicable . “you get the impression that almost all citizens who could vote were active participants and knowledgeable.” Partially because, at the time, universal suffrage wasn’t a thing. “Nevertheless, other evidence of education changes overt this long span of time makes me think that the ratio of thoughtful and well-considered voters was high originally and dropped over time.” Sure, everyone can trash John Dewy but do we really want to bring back liberal education? I mean, how many American students are prepared for that kind of rigor? “For one point, the framers would be scandalized to learn that a thorough treatment of American history was not part of a school’s curricula.” I am not so sure. During their time, what we now consider to be modern history–a factual and empirical narrative intended to present a factual account of what happened–was just coming into bloom with writers like Voltaire, Gibbon, and Hume. The closest you get to a modern historiographical account is the Ecclesiastical History of the English People of Venerable Bede and the Anglo-Saxon Chronicles. History, as they knew it, was largely passed down through custom and tradition where father tells son of what his father told him and so on through the generations. Men remembered events in the English Civil War not because they read a history on it, but because their grand sires likely fought in it or had opinions on it. One other avenue was literature. The propagation of literature was instrumental in preserving the memory of a generation and it was likely from the poets, not Bede, that they derived more knowledge of the past. To be perfectly honest, the framers’s wouldn’t recognize our method of education. Private tutors are now for children with difficulty learning whereas before, like with Philip Vickers Fithian’s tutoring of the Carters of Nomini Hall, they were the staple of gentry education. They would be confused as the to the curriculum not due to its lack of American history, but its lack of educational value. For today, consciously or no, education largely follows the modern system of factual learning. For the people in the framers’s time, education was often synonymous with formation and indeed the oldest universities in the US began as seminaries. Thus, education was not so much about learning facts as it was about knowing and understanding Truth. The distinguishing factor is this: the crossing of the Delaware is a fact; the courage displayed by Washington and his men in the crossing is Truth. Partially because, at the time, universal suffrage wasn’t a thing. How hip you sound. Of course, universal suffrage is still not “a thing” in the sense that no country is doing it nor has ever done it that way. The voting privilege in the new United States was broader than most, and has been expanded since, but is still not universal. Which makes sense: my youngest grandchildren would be barely qualified to vote for their favorite “Simpsons” character. Sure, everyone can trash John Dewy but do we really want to bring back liberal education? I mean, how many American students are prepared for that kind of rigor? Few indeed — but that’s exactly the point. Such rigor must be from the beginning. And I hadn’t mentioned the famous educator (it’s “Dewey” by the way), but I consider his legacy something of a mixed bag, and his followers have made rather a hash of things. History, as they knew it, was largely passed down through custom and tradition where father tells son of what his father told him and so on through the generations. Horsemanure. Do you also suppose they learned rhetoric by having it passed down from father to son? Read the writings of these people; they were not only very well educated in history and world affairs, they expected that their audience was as well. To be perfectly honest, the framers’s wouldn’t recognize our method of education. Here we agree. There is no authorization for federal involvement in education within the Constitution, and the form taken is reminiscent of Dewey’s notion that “the activity of the immature human being is simply played upon to secure habits which are useful.” He decried this while making use of it, and now we largely teach American history as told through the mindset of anti-American socialists and communists like Howard Zinn. I don’t agree with your definition of “Truth” — but Washington’s exploits and bravery are equally evident from the factual record. Those facts are diminished in favor of depicting him as a wooden-toothed slaveowner. His teeth were not wood, and his treatment of slaves (including the endowment he set up to take care of them) would be instructive if taught properly. Incidentally, I have no problem with religion being part of education, so long as participation in this aspect is voluntary. I’ve long said that I’d send children or grandchildren to a Catholic school because of the job they did with education in general — though I confess that being presented with you as an example gives me pause. Actually, Universal Suffrage is commonly used to define the unrestricted access for adult citizens to vote so it seems we are arguing from different definitions. I have never heard someone use the term in relation to Demeny voting. If you desire such rigor, then practically speaking you are advocating an educational system more strict and defined than Common Core. If you want to maintain your libertarian attitude, I don’t think liberal education is right for you. It is a system, traditionally speaking, that has been devoid of any freedom of choice in what you learn. Indeed, is this not what Dewey–I thank you for the correction–wanted to abolish? No, they learned Rhetoric the same way I did: read famous orators and imitate them. This was a time, after all, long before the text book. My contention is not that they were not well educated, but that history as we understand it could not have been something they studied since history as we understand it was in its infancy. It is also important to note, going back to the suffrage discussion, that their audience was about 6% of the white population who were just as educated as they were. They had no concept, at the time, of an enfranchised poor, not with most states having literacy and property as prerequisites for voting. I am not sure I agree specifically with the involvement of the Fed simply because none of them explicitly say “keep the Fed out of education.” yet, each man may have his opinion on it. To be perfectly honest, from a liberally educated person, facts of American history are largely irrelevant to education if the goal is liberal education. I would go as far as to say that the failure of the ivy league is less ideological and more teleological and epistemological. And Achilles was a wrathful and stubborn killer. But still his deeds in the Iliad are recounted as heroic. Washington WAS a slave owner; we can’t brush that under a rug or try to show that his good out weighed the bad. Unlike his neighbor Robert Carter III, Washington bought slaves and while he treated them better than others, he still owned them and used them for labor. I agree that all sides of a person should be examined, but no less in our criticism should we treat their vices. “…though I confess that being presented with you as an example gives me pause.” Indeed? I would say that one cannot long study the ancients without learning the folly modern man finds himself in. But all is vanity in the end. Both our strivings will end and we will be dust. So what does it matter? Your hypothesis doesn’t differ much from my own. I noticed you have a string of posts refuting the a blogger’s attack on Ted Cruz. Good job! Getting the truth out there is just about the only thing we can do. Being right is less important to some than appearances, and it is quite amazing what some people see in others.